City in Brief: The discovery of nickel ore led to the founding of Sudbury in 1883. 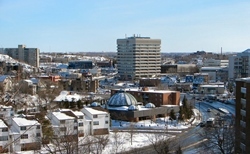 The city is officially known as Greater Sudbury following a merger in 2001, making this the largest city in Northern Ontario and the largest city by land area in the province. The city became a world leader in nickel mining, and in the 1930s was the fastest-growing and one of the wealthiest cities in Canada. Sudbury is a bilingual city with more than 16% of the population speaking French at home.